On the first day of session, the Senate made organizing look easy, the stalemate in the House became a reality, the House staff had their final day on the job, at least for now, and the governor got some mixed messages from Senate leadership. After the initial fight over whether Lt. Gov. Kevin Meyer could take on the responsibilities of the House’s presiding officer in order to receive Gov. Michael J. Dunleavy’s letter nominating Sharon Jackson to fill the vacancy in House District 13, the Hous­e took a break to huddle in caucus, get legal advice and then returned at 5 p.m. to promptly gavel out for the day. They’ll be back at 1 p.m. today to give it another go. The matter of speaker or speaker pro tem were never reached in the chamber. Meyer’s move to take any action on Jackson was somewhat surprising given that he’s acknowledged his limited powers in the House. That explains why, then, Dunleavy’s letter was addressed specifically to House Republicans and not to the House in its entirety, a point that Meyer attempted to make before things went awry. It’s not a communication to the House, he argued, it’s a communication to House Republicans. Rep. Chris Tuck, D-Anchorage, and his team had none of it, arguing it was a constitutional separation of powers issues. At this rate, this could very well be an issue that the reaches the courts. The appointment language in law is vague and it doesn’t make an appearance in the Legislature’s uniform rules, but the fact the governor took the route of addressing the letter to House Republicans seems to be an admission that, yes, there could be a problem. The impacts on the organization of the House could be dramatic. Without Jackson, the House’s party-line Republicans will be two members short of the 21 needed to claim a majority and that could deal a mortal blow to the current organization’s hopes of power. Picking up one with the current layout was already a big ask. Today’s also the day that legislative staff are no longer considered to be employees. That’s because there’s no chair of the House Rules Committee to approve hires, a point that Senate Rules Committee chair Sen. John “No ‘Smart Devices’ on the Senate Floor” Coghill made during the Senate Majority’s press availability. “I can tell you, if those things don’t go smoothly, then the agenda has a harder time,” Coghill said of the work that goes into being a Rules chair. 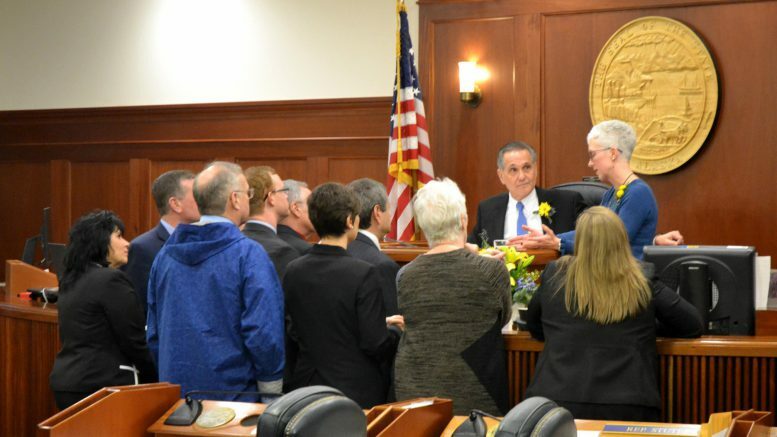 House legislative staff were told that they wouldn’t be considered employees starting today if some sort of agreement was in place, and that appears to be true according to Anchorage Daily News reporter James Brooks. Meanwhile, the convening of the Senate went off without a hitch. Sen. Cathy Giessel took over as Senate President, Sen. Mia Costello is Senate Majority Leader, Sen. John Coghill is Rules chair and Sen. Tom Begich is Senate Minority Leader. The Senate Majority even had time for a press conference on Tuesday, outlining its priorities for the session. Costello said, for her, that’s continued work on crime and “the repeal effort,” to which Giessel jumped in to add that it’ll also require work on the opioid crisis (though when asked about Medicaid expansion, Giessel punted on the issue). Senate Finance co-chairs Sens. Natasha von Imhof and Bert Stedman laid out a message that seemed to be intentionally out of step with the Dunleavy administration. While they said they looked forward to the cuts they’d be proposing, they both said protection of the Alaska Permanent Fund and its earnings reserve account are critical goals this session. While they didn’t address Dunleavy’s promise of a back payment of PFDs—or a “fully funded” 2019 dividend for that matter—they didn’t seem particularly keen on an unstructured draw out of the Alaska Permanent Fund’s earnings reserve account, which has been Dunleavy’s go-to source to pay the super-sized campaign promise. “To have an unstructured draw out of the permanent fund, that’s going to erode market returns, erode long-term balances and erode the life of the fund,” von Imhof said. The Senate Finance Committee at the very least isn’t going to be waiting around for the House, according to Stedman, who met questions about the working relationship with the tone of an exasperated parent. Happy first day of session Juneau! Be the first to comment on "AKLEG Recap Day 1: ‘Dear Republican Members’"